Our people at KaTech have comprehensive experience of all aspects of food manufacturing and are committed to supporting our customers achieve both technical and commercial success. We are dedicated to providing you with all the options and the information to select the best solution for you. To view our teams, please select the relevant tab below. Stephan Kahlert finished an education as specialist for food technology in 1981, with Carl Kühne KG. From 1989 he took over the duties as a production manager and Quality representative. In 1996-2001 he changed to G. C. Hahn & Co. (later Tate & Lyle Food Systems) in the development department, then changed to sales in 2001, at last responsible for the region UK/Scandinavia and Key-accounts North Germany. Stephan is mainly working in the savoury area. Ulrich Schoo has been a food technologist since 1983 and for ten years as a manager he has been responsible for product development within the frozen food industry at Schneefrost GmbH. In 1993 he started at G. C. Hahn & Co., later Tate & Lyle Food Systems as a sales manager for convenience food with a focus on delicatessen, convenience food, meat processing and deep frozen food. Ulrich has been a key part of many successful new product developments and launches. Siegfried Blab completed vocational training as a dairy specialist and dairy master technician in Kempten, Germany in 1987. He has more than 25 years of considerable experience of the food industry, at e.g. Tews GmbH, G. C. Hahn & Co. and Tate & Lyle Food Systems. His expertise is the dairy area, he has been involved in many successful projects. Claus Schierholz has worked in the food industry for over 40 years. In 1977, Claus gained a Dairy Master degree at Fachhochschule (University of Applied Sciences) MLUA Krefeld, Germany. Claus has vast experience in the dairy sector and within his previous roles at Tews GmbH, G. C. Hahn & Co. and Tate & Lyle Food Systems he has been responsible for key customers i. a. in West- and East Europe, former CIS countries and Asian markets. Bernd Brandes completed vocational training as a dairy specialist and dairy master technician in Kempten Germany in 1988. He has more than 25 years of considerable experience in the food industry at e.g. company Frischli, Nestle, G.C.Hahn & Co. and Tate & Lyle Food Systems. Since 1991 he worked in product development and changed to sales in 2009, at last responsible for the region Scandinavia. His main experience is the dairy area, he has been involved in many successful projects. Cyril Carrat graduated from Montpellier University with a Masters in Food Science and Technology in 1996 and has worked internationally in various companies specialising in the added-value food ingredient industry: Macphie of Glenbervie, G. C. Hahn & Co, Tate & Lyle Food Systems and National Starch. Cyril has specific knowledge in developing and delivering fast, relevant and commercially viable tailor made solutions. Alexander Maesse has over 16 years experience in the food sector. In 2004 he has completed his studies for dairy food engineering at the University of Applied Science in Hannover as an Engineer. Before and during his studies he was employed in various dairy companies. He then worked for the company G. C. Hahn & Co. GmbH / Tate & Lyle Food Systems in Luebeck in the development as a food technologist and has gathered experience in various country markets. His focus is in the area of fermented and neutral dairy products as well as vegetable fat cream. From 2007 to 2011 he was head of development at G. C. Hahn & Co Ltd. in the UK, responsible for the country markets India, France, Spain and the UK. There, he has especially focused on clean label development, on which he gained extensive experience. Markus studied for a degree in Food Technology at the Rheinische Friedrich-Wilhelms-Universität in Bonn (Diploma Engineer). In his former job as a project-technologist he worked for renowned companies designing stabiliser systems, such as Hydrosol GmbH & Co. KG, G. C. Hahn & Co., later Tate & Lyle Food Systems. to help them bring new products to the market, working on cost savings and troubleshooting. He was partly based in UK, where he was responsible for the dairy development for international markets of UK, France and India. Markus Tietjen is a skilled and experienced food technologist and his area of expertise includes dairy development. Markus completed his apprenticeship to become a specialist in food technology at Campbell Germany GmbH successfully.Afterwards Markus studied Master of Science in food technology at the University Neubrandenburg and graduated in 2015. In the period before and during the study Markus acquired and applied extensive practical experienceat the company Schwartauer Werke GmbH & Co. KGaA, H. & J. Brüggen KG, Friesenkrone Feinkost Heinrich Schwarz & Sohn GmbH & Co. KG, G.C. Hahn & Co. GmbH and Unilever Deutschland GmbH. Markus main focus is the development of dairy products. After successfully training to become a dairy expert at Breitenburger Milchzentrale eG, Björn was able to gather comprehensive knowledge in the area of diverse dairy products. In 2008 Björn successfully passed a further training course to become a food technologist at the KIN Institute in Neumünster. Before and during this course Björn was able to acquire practical experience at the companies Symrise AG in Holzminden, G.C. Hahn & Co. Ltd. Mold, UK and at the company G. C. Hahn & Co., later Tate & Lyle Food Systems. As a dairy technologist, Björn was mainly responsible for the markets in Russia and former GUS states, the Middle East, the Balkan states and Germany. The experience and extensive knowledge of regional products he developed in those countries is now an invaluable asset to KaTech’s international customers and the development of future product concepts. Stephan Jensen worked as a chef in the army and in hotels in Hamburg before going back to school and training as a food technologist in the mid 1990s. His first job in food production was for German ready meal manufacturer Jürgen Langbein GmbH, as assistant to the company’s production manager between 1996 and 2000. Here, he picked up considerable expertise in areas including sterilization, pasteurization, measurement of F-value and installation of filling and closing machines for cans and twist off caps. In 2000 he changed to G. C. Hahn & Co., later Tate & Lyle Food Systems. His expertise is the area of fine food products as well as soups-, sauce- and sterilised ready meals. G. C. Hahn & Co., later Tate & Lyle Food Systems as an assistant in the field of sample production/prototypes for customer presentations, which she later took over on their own responsibility. In 2004 she was responsible for customer projects as a project technologist, delivering focused innovative products and new creative flavour combinations. Until 2013 Doerthe worked as product developer at Terheggen & Dethlefsen. Horst Steen trained as a butcher with the main focus on “production of delicatessen and preserves”, before completing a cooking training during the army. In 1994, he continued his education and completed his education as a food technologist. His first activity in the food industry led him to the largest soup and ready meal producer, Erasco. Here he worked for 5 years as a product developer and gained extensive knowledge in the production of soups and ready-to-serve meals as well as sterilization, pasteurization, measurement of the F values. In 2002 he moved to the company G. C. Hahn & Co., later Tate & Lyle Food Systems. He gained extensive knowledge in the stabilization of food world-wide. His main focus is in the field of emulsified delicatessen products as well as soups, sauces and sterilized ready-to-serve meals. Patrick Wotherspoon has more than 28 years’ experience in new product development, process technology, quality assurance, microbiology, and food ingredient sales. As a food technologist, Patrick has helped launch products for all the major retailers, handling all aspects of the process from kitchen samples right through to factory trials, commissioning and product launch. He has worked across the UK food industry, generating new innovative products, process optimization, troubleshooting and product value engineering and has vast experience and knowledge of a wide range of raw materials including hydrocolloids, emulsifiers, milk proteins and starches. Robert Hooton has more than 28 years’ experience in new product development and food ingredient sales. As a food technologist, Robert has helped launch products for blue chip retail clients, handling all aspects of the process from kitchen samples right through to factory trials, commissioning and product launch. He has worked across the UK and Irish food industries, developing ideas and solutions for new products, troubleshooting and product value engineering and has vast experience and knowledge of a wide range of raw materials including hydrocolloids, emulsifiers, milk proteins and starches. With 19 years of food ingredient experience, Nicola started her career in food phosphate Chemistry at Albright &Wilson/ Rhodia Food whilst studying Food Science and Nutrition at Oxford Brooks University. Then spent two years focussing on technical services for a Fiske Food Ingredients for the application of a wide ingredient portfolio incorporating starches, hydrocolloids and nutritional products. Nicola worked for 10 years at G.C. 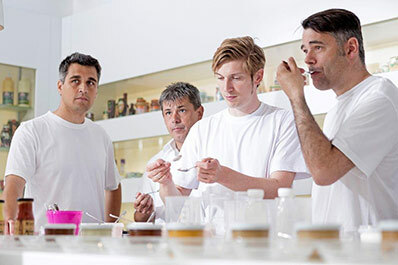 Hahn/Tate & Lyle Food Systems on the technical and commercial implementation of functional ingredient systems through kitchen and factory processes of multiple sectors of the food industry. Working with NPD and process teams to ensure optimum ingredient integration within their businesses to ensure project briefs are met. With a “hands-on” solution provision she approached to provide trouble shooting initiatives, cost savings, improved efficiencies, product reformulation, shelf life extension and texture modification to name a few. Joined the team at KaTech in 2016. Tobias began his career in the food industry twenty years ago at G.C. Hahn & Co. in Luebeck (Germany), later Tate & Lyle food systems. He achieved his State Certified Food Technologist certificate from the highly respected Lebensmittelinstitut KIN (Germany) in 2008 and a further degree five years later in Business Studies and Sport Exercise Science from the University of Chester (UK). He was then recruited by the North West Food Research Development Centre, a £5.2 million project co-funded by the European Regional Development fund. Tobias is currently undertaking a Masters in Business Administration to complement his knowledge of food process technology, product development, sports nutrition, process, project and strategic management. During his career he gained expert knowledge within the European dairy market and was responsible for product development in Germany, UK, France, Spain and India. After joining the KaTech team, Tobias will play an important role in development of the UK dairy market as a Senior Dairy Technologist. Tim Weaver graduated from North East Wales Institute then progressed into the food industry in 1995 within Quality Management whilst studying Quality Assurance. During this period, Tim built a background knowledge of food technology. Now, with 13 years experience Tim is a highly knowledgeable food technologist specialising in dairy, desserts and fruit applications and has extensive practical knowledge in creating, testing and applying clean label solutions in all application areas. Gary Alliston graduated from John Moores University after studying Food and Nutrition. Gary worked in the catering industry for 9 years before joining KaTech. Gary began working as a Technical Assistant building a background knowledge of dairy and savoury food technology. He is now a vital part of the team, working as a Savoury Food Technologist responsible for the UK market. Paul started his career in the food industry 30 years ago in quality and development of beverage powders at Premier Brands, followed by development and quality roles at Manor Bakeries, bakery development at Macphie of Glembervie, and product and process development at Markbeech Products. Paul was bakery technologist at G. C. Hahn from 2003-2008, after which he was Key Account Manager for Molda UK for freeze dried fruit and dried food ingredients covering the UK, Benelux and Middle East. Paul has extensive experience and know how in fine bakery products and processes. Aleksander Konieczny graduated from Chemical and Process Engineering at Wrocław University of Technology with a M. Sc. Eng. degree. He has been professionally active in the food production sector for more than 25 years. Aleksander ran his own ice cream and bakery company. After that, he worked as a technologist, the head of R&D and the manager of a modern dairy production plant. Before joining KaTech the last 15 years of his professional path was working for G.C. Hahn & Co, beginning as the technologist and eventually becoming the Managing Director of the Polish branch. During that period he participated in creating numerous new products for the Polish food market. He has experience in various branches of food technology, with main focus on dairy products, fine food and ice cream. Artur Dyba graduated from the University of Technology in Poznań with a M. Sc. Eng. degree. He has worked in the food industry right from the beginning of his professional career. After graduation he worked as a consultant for ISO and HACCP implementation in a number of companies in the food sector. In 2004 he started working for G.C. Hahn & Co. as a specialist for sales and technology. His areas of expertise included dairy products, mayonnaise, as well as ready meals. When joining KaTech in 2013, he had 10 years of professional experience in offering food ingredients to the clients, launching new products and solving technological problems. Steve Williams has more than 15 years experience in international purchasing & commercial environments having worked with many international clients. Steve has extensive knowledge of the raw ingredients market for global food manufacturing – including dairy, starches, gelatine and hydrocolloids. But his role is about far more than just ‘buying’. Steve’s approach is both dynamic & commercial in a strategic business orientated role and is highly customer focused. Strategic Supply Chain Management & commercial commodity awareness, ensure the business can operate on a sound commercial basis. His role involves margin responsibility for the overall business.